A central question in Congress’ current debate over health care reform is how to approach the Affordable Care Act’s (ACA) essential health benefits (EHB). The American Health Care Act (AHCA) passed by the U.S. House would let states apply to waive EHB rules. The revised Better Care Reconciliation Act (BCRA) unveiled in the U.S. Senate today would let insurers sell plans that do not meet EHB and other requirements so long as they offer at least 1 plan that does. This post explains EHB and how the relevant provisions of the AHCA and BCRA and subsequent decisions by Tennessee’s policymakers could affect health insurance choice and costs in Tennessee. What Does Mandating Essential Health Benefits Do? The ACA’s EHB requirements help people with greater health care needs access and afford adequate coverage. However, they also require that people with fewer health care needs buy higher-cost plans with more coverage than they might want. What Are the ACA’s Essential Health Benefits? How Do Essential Health Benefits Affect Tennesseans? The EHB largely reflects the kinds of services covered by most employer-provided plans. In fact, Tennessee’s “benchmark plan” (against which individual market plans are compared for compliance with EHB) is the largest plan sold in the state’s small group market, which caters to small businesses. Prior to the ACA, Tennessee had a more limited set of required benefits for individual market plans – including things like emergency services, services for autism, and mammograms. Plans did not have to cover services that were not explicitly mandated, such as maternity and behavioral health care. In addition to what plans must cover, the ACA also standardized how much plans must cover. 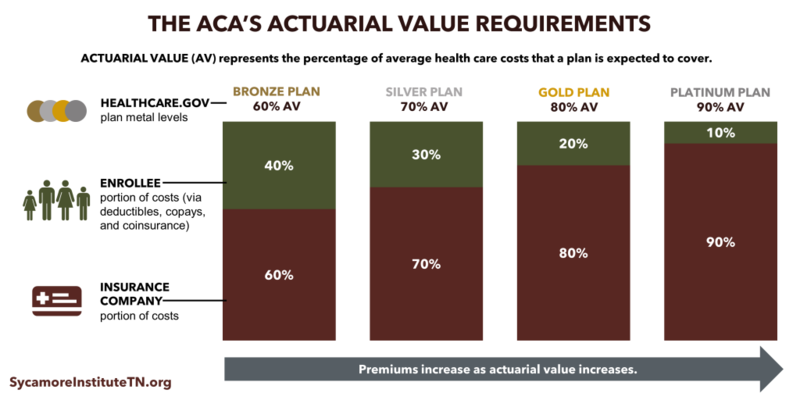 The percentage of average health care costs a plan is expected to cover is known as “actuarial value” (AV). A “silver” plan on the healthcare.gov Marketplace, for example, must have an AV of 70%. This means that, on average, people in that plan can expect to pay for 30% of their health care costs out of pocket through deductibles, copays, and coinsurance. 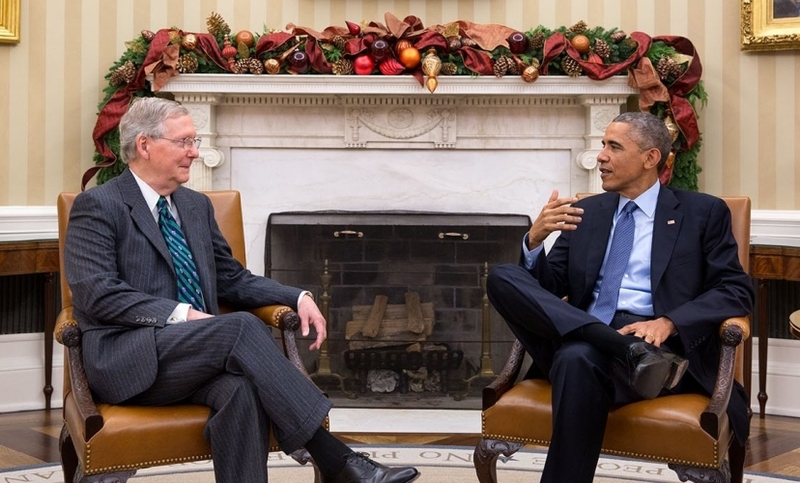 What Are the Purposes and Trade-Offs of the ACA’s EHB? The EHB serves several purposes, each with their own trade-off. The ACA’s EHB and AV requirements aim to ensure that health insurance plans cover the services needed by the sickest individuals. The financial protection this provides enrollees with high health care needs comes at the cost of more expensive premiums. It also means that individuals with fewer health care needs must pay for benefits they may not want. Standardizing benefits limits the potential for segmented risk pools. 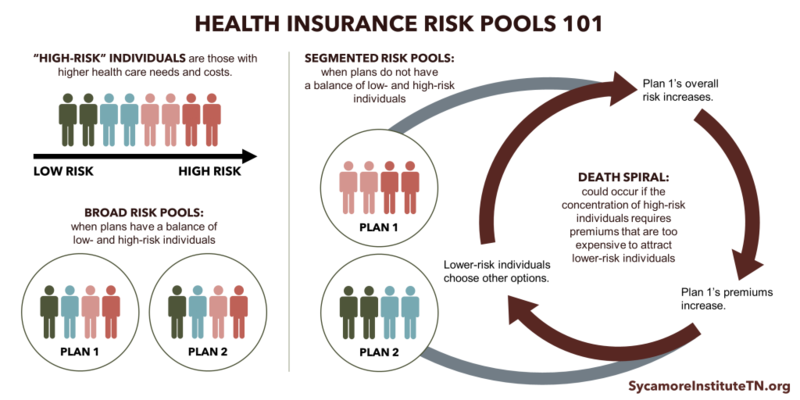 In order to keep low-risk and high-risk individuals in the same risk pool, however, the EHB rules limit consumers’ choices. Standardized benefits and cost-sharing may make shopping for and comparing plans easier, but again, the approach limits choice. What Are the Trade-Offs if Congress Changes EHB Requirements? The BCRA and the AHCA would both loosen the rules for what plans must cover, but in different ways and with different trade-offs. The House-passed AHCA could potentially let states redefine the EHB to include fewer benefits or lower AVs. If Tennessee did this, plans in the individual market would likely have lower premiums and skinnier benefits. This approach would still limit risk pool segmentation. The trade-off is that it would continue to limit choice, and sicker individuals may no longer have access to adequate coverage and could face higher out-of-pocket costs. The Senate’s proposed BCRA would let insurers offer plans that do not meet EHB requirements (states would also have the option to do this under the AHCA). This approach would likely result in lower premium options in the individual market, creating more opportunities for healthier individuals to purchase plans that better meet their needs. However, risk pools would likely become segmented. More generous plans that meet the needs of sicker individuals may still be available but could become too expensive even for the highest-risk individuals. Although the specific details differ, the overarching trade-off largely remains the same: Congressional health reform efforts will likely reduce costs in the individual market for young and healthy people and increase them for older and less healthy people. How these trade-offs might be felt across Tennessee will depend on a number of factors – including demographics and health status.